Cloud Computing is growing, and every solution provider wants to be part of the hype. This new trend promises to abstract IT professionals from the underlying nuts and bolts of server virtualization, storage allocation, scalability, availability, and operational overhead. It also aims to deliver on-demand, self-servicing capacity to reliably run applications through a simple administration console that allows you to monitor service levels and react accordingly. 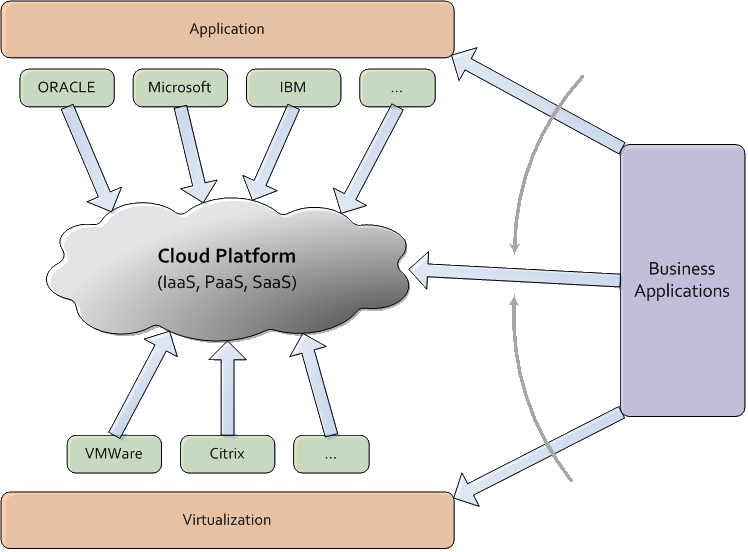 In a nut shell, this is the main idea of Cloud Computing. Every company has realized the potential of this new idea, and they are all rushing to provide the most comprehensive solution. Cloud solutions come in many forms. Some providers even cover all the different flavors, being IaaS (Infrastructure as a Service), PaaS (Platform as a Service), and SaaS (Software as a Service) the most common. So, what we see is, companies traditionally from the application infra-structure arena starting to incorporate virtualization solutions into their platforms and deliver Cloud Platforms in one or all of its forms. 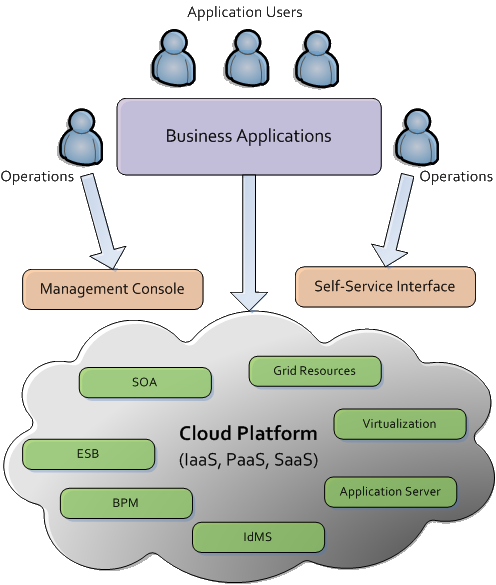 We also see companies, traditionally from the virtualization solution market, providing better management solutions, and partnering with application solution providers to deliver their Cloud Platforms, in one or all of its forms. Another question that may arise is, if you are out in the market to purchase one of these solutions, which one best serves your interests!? Hard to tell, but I would say that it all depends on your particular requirements. Companies like VMWare and Citrix have strong virtualization products. VMWare, in particular, has partnered with a few other companies to provide virtual appliances with operating systems, database management systems, application servers, CRM, ERP, collaboration and communications solutions, etc. On the other side of the spectrum, companies like ORACLE, Microsoft, and IBM, also provide excellent solutions based on their application infrastructure and own virtualization solution. ORACLE, Microsoft, and IBM are extremely good in application infrastructure and are gaining expertise in the virtualization field. ORACLE has its virtualization solution based on the Xen open source solution, and is in the process of acquiring Virtual Iron and SUN Microsystems both of which have virtualization solutions based on Xen. Microsoft has its own Hyper-V solution. All of them also support VMWare virtualization solutions. Bottom line, every new reference enterprise solution in the market is aiming at the “clouds”, providing a new form of DataCenter architecture based on simplicity and ease of use. Computer systems often evolve towards the use of standards achieving complex architectures based on building blocks made of well-known and reliable technologies. We have seen it in the past from objects, to components, to services, to composite applications, from virtualization, to RTI, to Cloud Computing, and will continue to see more and more levels of abstraction. The most recent solutions from Microsoft and VMWare incorporate Cloud principles into their virtualization solutions. This is a predictable move since one of the major features of Cloud solutions is their elasticity which is accomplished heavily through virtualization. Cloud Computing solutions provide sophisticated administration tools, as well as, service level monitoring tools. Consequently,for visionary companies like Microsoft and VMWare ,extending these tools to their virtualization offerings is expectable. Additionally, VMWare extended its product to allow On-Premises installation, allowing customers to mitigate most of their security issues raised by an Off-Premises Cloud solution. Microsoft´s position on this isn´t yet clear. Microsoft´s solution, taking the company’s background in consideration, targets the developer community, providing an integrated PaaS solution, including application services, database services, access control services, etc. VMWare, on the other hand, relies on established partnerships to provide production ready application services through its Virtual Appliance Program. VMWare has a credible solution to implement DataCenter setups On-Premises. The downside of VMWare´s solution, is that it only provides an IaaS solution which is expectable from a company that dedicates itself to virtualization solutions. Nevertheless, VMWare has established several partnerships with various application software providers to deliver Virtual Appliances that provide application engines (e.g., WebSphere), database engines (e.g., ORACLE), etc. 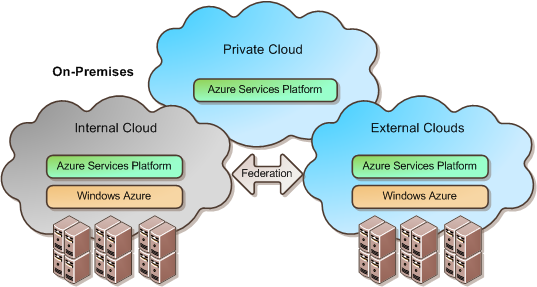 Microsoft´s Cloud solution is more complete, in the sense that, it provides a fully loaded PaaS solution. Since I have dedicated some entries on this blog to Microsoft´s Cloud Solution, I will now concentrate on VMWare´s solution. 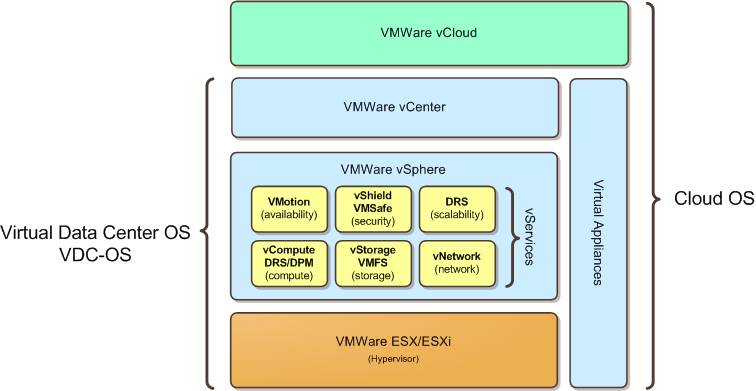 The evolution of VMWare´s offerings has gone from a pure virtualization solution to a virtual DataCenter solution, with sophisticated administration tools, to a Cloud IaaS oriented operating system. With its vCloud solution, VMWare delivers a Cloud operating system for Cloud providers. Many of these companies have already implemented VMWare´s vCloud solution, and this is expected to continue. VMWare is also targeting On-Premises installations, and taking advantage of the fact that Microsoft hasn´t taken a stand on this kind of installation. So, how do all of these technologies fit in the solution market? Basically, solution wise there are two main different areas of virtualization, server virtualization, and desktop virtualization. Both of these provide increasingly more sophisticated administration tools that allow for effortless virtual machine allocation and service level monitoring. Virtualization, as we know it, is ending. The technologies behind it are growing strong and will continue to do so, but Cloud Computing is forcing virtualization to be seen as IaaS (Infrastructure as a Service). Nobody really cares about dealing with virtualization´s nuts and bolts; companies demand ease of use. Increasingly more sophisticated solutions are emerging for both external and internal Clouds that will push us to redesign our DataCenters, and see it as a self-service infrastructure. More on this very shortly.